Ha, the old Sorcerer's Apprentice + Molten Reflection + Archmage Antonidas trick! This is actually quite good with Golden Monkey. Extra turn for dropping legendaries and trading can lead to some pretty sick comebacks. Of course, not as reliable as using it for an OTK, but still cool. 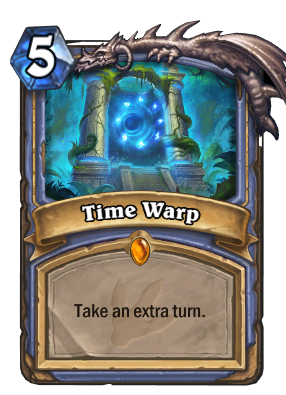 Except that you wasted a time warp and the cost through the game is still 8 mana. This combo will drive your opponents insane. Do that, and you'll hit Rank 1 Legend in no time. Be sure to do it again repeatedly. And "draw a card, refresh your hero power." Meh its a bit more difficult than giants but still would be fun. Also requires a clear board of opponent to ensure lethal. Finally Nozdormu is the counter for this! 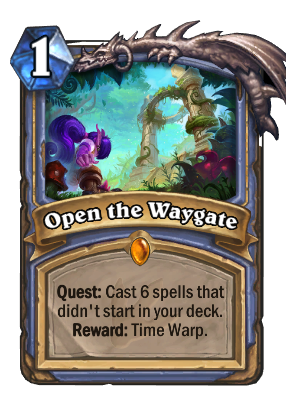 Seems a bit long to actually get the card : "Cast 6 spells that didn't start in your deck"
Standard Exodia Mage is now viable. Step 1: Finish the quest. Step 2: Have at least 8 Mana and 2x Sorcerer's Apprentice, 2x Molten Reflection, and x1 Archmage Antonidas. Step 3: Play 2x Sorcerer's Apprentice (4 Mana), play Molten Reflection (2 Mana after reduction) on a Sorcerer's Apprentice, Play Time Warp (2 Mana after reduction), and end your first turn. Step 4: Play Archmage Antonidas (7 Mana), play Molten Reflection on a Sorcerer's Apprentice (1 Mana after reduction), use the unlimited 0 Mana Fireball chain from Antonidas to win. INSTANT WIN PLAY in WILD after you finished the quest? It has it for two mana too, but that was just ridiculus.